Piney Narrows Yacht Haven on Kent Island offers 278 open and covered slips for boats up to 60’ in length. Our marina in the Kent Narrows is perfect for active boaters who want a comfortable, convenient and community-oriented home port. Slip owners and guests enjoy resort features, including a beautifully landscaped swimming pool, a yachtsman’s lounge, cable TV at every slip, two laundromats, picnic stations and paved parking. Piney Narrows Yacht Haven also offers security – the whole property is protected by key card entry. Additional amenities onsite include a complete marine repair facility with hauling for up to 60 tons. Guests will find sales of new and brokerage yachts, as well as marine supplies. Pumpout services are available, and free with a slip. Piney Narrows Yacht Haven has one of the best fuel docks in the Chesapeake Bay and offers gas and diesel at competitive prices. What else is there to love about Piney Narrows Yacht Haven? It’s fantastic location in the heart of the Kent Narrows, of course! Often referred to as the “Hub of the Chesapeake,” the Kent Narrows area offers boaters a great jump off spot to popular cruising destinations in the Chesapeake Bay, including St. Michaels, Oxford, Tilghman, Rock Hall, Chestertown, Annapolis and even Baltimore! Even better, coming home to the Kent Narrows is just as fun. 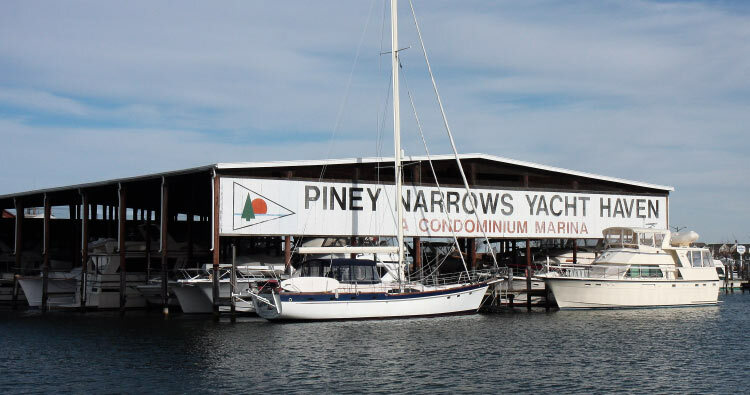 Piney Narrows Yacht Haven is close to great restaurants, tiki bars, fun nightlife, fishing charters and so much more. Located on the waters of Kent Narrows. 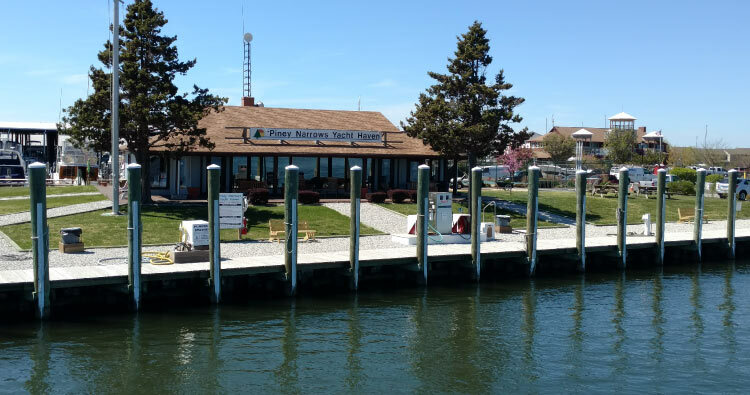 At Kent Island, Maryland a few miles from the Bay Bridge and also in Fort Lauderdale, FL, Bayport Yachts represents the sale of Yachts nationwide. Bayport’s Yacht Brokers are licensed in both Maryland and Florida. Bayport Yachts specializes in the sale of Trawlers, Yachts and Cruising Power Boats such as Hatteras, Tiara, Grand Banks, Viking Chris Craft, Albin, Monk Ocean Yachts & Gulfstar to name to name a few. We excel in the sale of “one of a Kind” antique, classic and custom yachts such as Trumpy, Broward, Burger & Matthews. Please visit our website or call us at 410-212-5264. Kent Narrows Yacht Yard is a full-service yard located on the Chesapeake Bay. Since 1999, we have been covering all of your yachting needs. We have a 60 ton travel lift. We specialize in engine repair & re-powering as well as Awlgrip refinishing. To see more of our services, please visit our website or call us at 410-643-4400. Hurricane Awning & Canvas, LLC is located in Kent Narrows at Piney Narrows Yacht Marina on Kent Island, Maryland’s Eastern Shore. We’ve been located here at this location for over 20 years. We are a full-service canvas shop that specializes in custom fabrication of all our canvas products. Our staff are all experienced craftsman that take great pride in their work. We provide all our customers with a hands-on approach by guiding them throughout the design process. Our expectation is to always provide you with the highest quality job throughout the fabrication, design, and installation of each product. We are committed to an honest relationship and appreciate all jobs, big or small. Please visit our website or give us a call at 410-643-7840.